Virtus.Pro eliminated, not just one, but two of their biggest competition of the tournament during their lower bracket run en route to securing a spot in the lower bracket finals in Day 2 of the arena day of the DreamLeague Major 2019 in Stockholm. Both PSG.LGD and Team Secret found themselves being eliminated by a Virtus.Pro team that capitalized on the smallest mistakes that they made while also making very few of their own. Now, Virtus.Pro are staring down at the very real possibility of making to their third Major grand finals in a row and a chance to win their sixth Major ever, with the only team standing in between them being Fnatic, the team that sent them down to the lower brackets early on in the tournament, and Vici Gaming, who came from qualifying via the StarLadder ImbaTV Dota 2 Minor in Kiev to guaranteeing themselves at least a second-place finish at the DreamLeague Major 2019. Virtus.Pro were sluggish to start the tournament. Missing were the aggression and the decisiveness that we’ve often seen from them so often these past couple of years. However, with their backs against the wall, the CIS juggernauts woke up like the bears from slumber and proceeded to take a mile from every inch of space that their opponents gave them. To say that this is the Virtus.Pro that we expected to see heading into the DreamLeague Major 2019 is only fitting. Fnatic were able to take advantage of Virtus.Pro’s lackadaisical approach by sweeping them in the opening rounds of the playoffs. But, since then, Virtus.Pro, specifically, 9pasha and RodJER, have stepped up their games and played to their usual standards if not better. On the other hand, we saw Fnatic’s weaknesses exposed by Vici Gaming. Aggressive, but overeager, Fnatic saw themselves letting go of the huge early leads that they built against Vici Gaming in all three games, a mistake that would eventually come back to haunt them in Games 2 and 3 as they saw the series and a grand finals berth slip from their very hands just because they lacked the discipline to know when not to push the issue after building a decisive lead. The 18-year-old Abed, in particular, was particularly careless. Although he was able to win his lanes comfortably in all three games, his overextensions at various points throughout the series proved costly for Fnatic. Virtus.Pro, though, equally aggressive themselves, are far too experienced and disciplined to fall to the same trappings that currently plague Fnatic. A battle between two top Dota 2 teams often comes down to which team makes the first mistake. The best Dota 2 teams are experts at punishing opponents for overextending, or forgetting to press the issue when they had the lead. Virtus.Pro have managed to stay on top of the Dota 2 scene for the past two years because, even though they are one of the most aggressive teams, they’re disciplined enough to know when to back down and temper their aggression. Not to mention, they’re also extremely versatile and seemingly unafraid to try out new things even in the most crucial of moments. Case in point, Virtus.Pro’s decision to run a five-core lineup against Team Secret in Game 3 of their series in the lower brackets. Knowing all too well that their lineup could not keep up early on, Virtus.Pro simply bided their time until all five of their players got too big for Team Secret to handle. That decisiveness and ability to plan two steps ahead of their opponents, even someone as skilled and talented as Team Secret, is something that Fnatic is severely lacking. 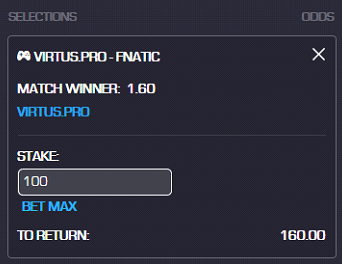 For that very reason, our money’s on Virtus.Pro walking away with the win and a chance to play for their sixth Major title against Vici Gaming in the grand finals of the DreamLeague Major 2019.